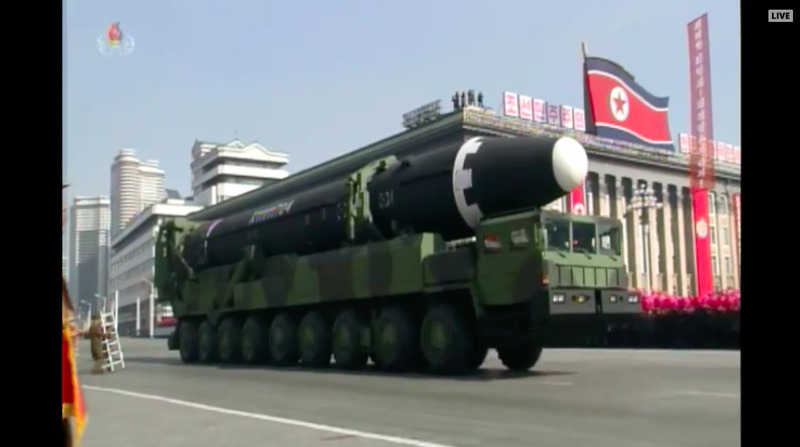 North Korea defied the world by holding a massive parade and show of force with ballistic missiles Thursday despite being under heavy sanctions. Kim Jong Un, one of whose sisters is scheduled to visit South Korea for the Olympics, gave a speech warning against invasion. 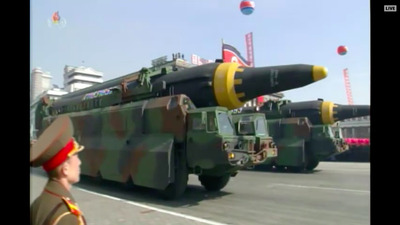 North Korea showed off several types of missiles, two of which are believed to be capable of hitting the US. North Korea on Thursday, the eve of South Korea’s Pyeongchang Winter Olympics, rolled out a long convoy of missile trucks and paraded them through the North’s capital of Pyongyang. Kim Jong Un gave a speech in which he appears to have made boilerplate remarks commemorating the 70th anniversary of the founding of the Korean People’s Army and warning off its enemies. “At a time like this when the US and its followers are making such a fuss around the Korean Peninsula, our military should remain on high alert and step up preparations for fight, so that invaders cannot violate … the dignity … of our sacred nation even by 0.001” millimetre, Kim said, according to AFP’s Seoul correspondent, Hawon Jung. One of Kim’s sisters is expected to attend the Olympics in Pyeongchang, where she will meet with South Korean President Moon Jae-in, but that was not discussed. Vice President Mike Pence will also attend the games, but North Korea has said it has no intention of meeting with him. 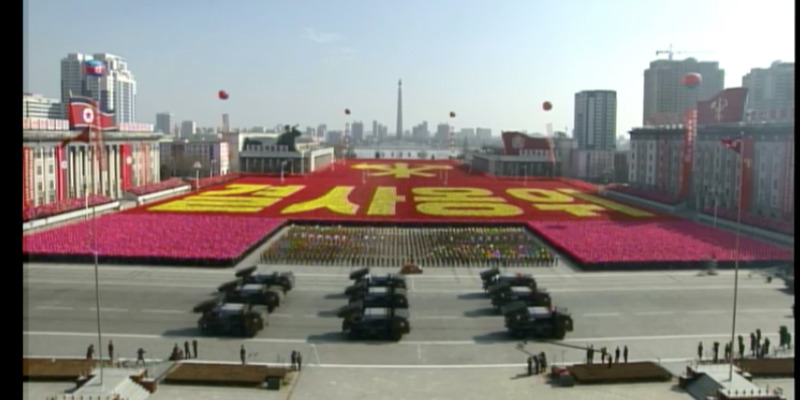 The focus of this parade was clearly on North Korea’s fighting strength and not efforts for peace. As soon as images of missiles appeared in Pyongyang, analysts got to work. Three types of missile piqued their interest: six mid-range Hwasong-12 missiles; three Hwasong-14s, North Korea’s first intercontinental ballistic missile; and four Hwasong-15s, the most recently tested missile, which experts say can strike anywhere in the US. 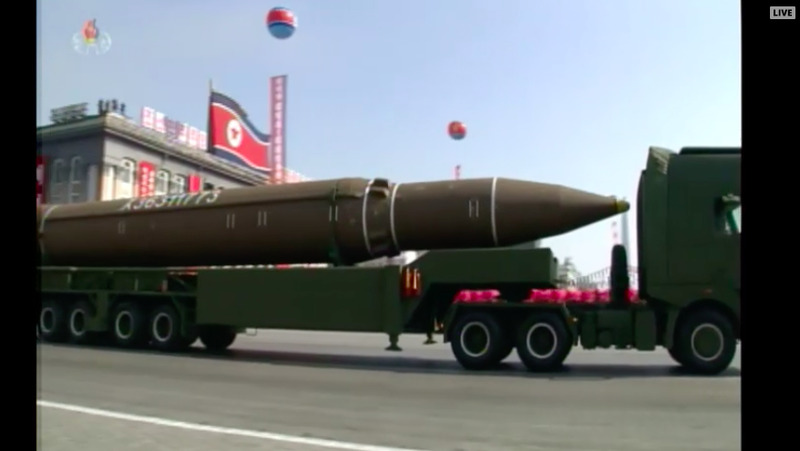 The parade paled in comparison with one in April of last year, when North Korea displayed more missiles and a wider variation, but it featured an increased emphasis on long-range missiles that could hit the US and its territories. North Korea has previously threatened to fire Hwasong-12 missiles toward the US military base on the Pacific island of Guam and to test a nuclear bomb over the Pacific with a long-range missile. Either test could swiftly lead to US retaliation and a larger war. Nonetheless, amid heavy sanctions, North Korea’s successful military parade perhaps quelled rumours that Pyongyang’s spirit had been crushed by President Donald Trump’s maximum-pressure campaign. Though fuel prices in North Korea have doubled over the past year, which may have been responsible for a reduction in military exercises in January, Kim’s government found the resources to put the show on. 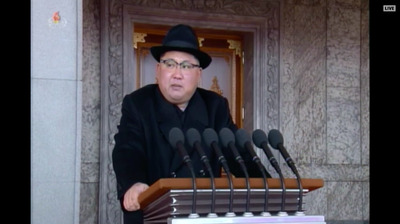 KCTVKim Jong Un making his brief speech. 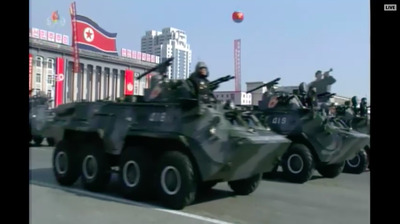 KCTVArmoured personnel carriers making their way through the square. 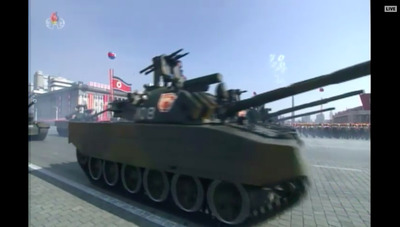 KCTVNorth Korea’s massive artillery guns. KCTVThe Hwasong-14, North Korea’s first intercontinental ballistic missile. KCTVThe Hwasong-15. The biggest threat to the US.